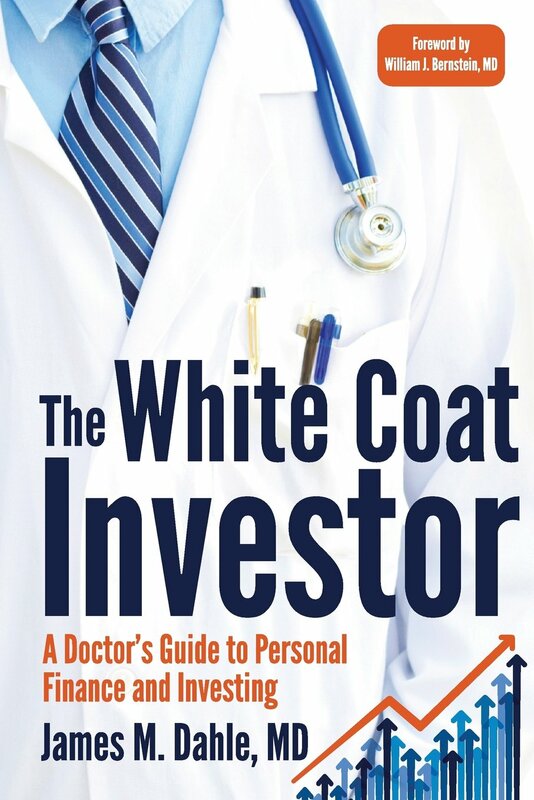 Book Review of the White Coat Investor and Giveaway! Editor’s Note: Leave a comment below to be entered to win one of two copies of the book! It was right around this time one year ago when we found out that my fiancee had gotten into medical school. She had always dreamed of becoming a doctor and now she was one step closer. For those of you not familiar with the process, just applying to medical school is an arduous task. It’s like applying for college all over again but it takes way more time and it’s way more expensive. There are applications to fill out, the MCAT to study for and(if you’re lucky) interviews all across the country. But in the end, it was all worth it since now she’s one step closer to becoming a doctor. I was ecstatic for my fiancee when she got in, but naturally I started thinking about the financial side of things and how we were going to pay off nearly 200k of debt. 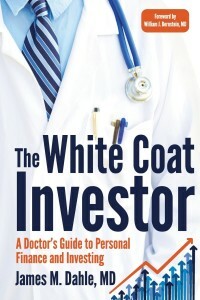 One of the resources that has helped me tremendously is a blog called, The White Coat Investor. It’s run by an ER doc named James Dahle but you would never know that his formal training is in medicine based on how much he knows about personal finance. His background is a lot like mine and that might be one of the reasons why I like his blog so much. I too, come from a non-financial background(aerospace engineering) but at times I feel like I know more about investing and personal finance than I do about my day job. Hopefully Jim knows more about being a doctor though. The first thing a casual reader might ask themselves about this book is does it apply to me? Even though it is clearly tailored towards medical students, residents and practicing physicians, there is still a lot of valuable information in there that applies to all high income individuals(think lawyers, dentists and other professionals – even engineers like me). This book is a must read for anyone involved in the field of medicine. The reason why it’s so good is that it covers everything you didn’t have time to learn during medical school, college and high school. Most people don’t seriously start thinking about their finances and investing until after college(that’s how it worked for me at least) but doctors usually go straight to medical school after college. And trust me there is very little time for learning anything other than medicine during those four years. Most med students are more likely to unwind with a beer and an episode of Real Housewives than pick up an investing textbook. The path to becoming a doctor just doesn’t allow for much time to learn about investing but you need to make time. I think this book can provide the most value for medical students and residents since the earlier you start thinking about this stuff the better. The overarching theme that I took away from the book is that although the landscape for doctors is changing you can still live a pretty amazing life. Here are the facts: it’s getting exponentially more expensive to go to medical school and the average doctor’s salary is going down. That means that when you graduate medical school, you’re likely to have a large amount of debt and you won’t be getting paid the same amount as your colleagues from previous years. When I started medical school at the University of Utah in 1999, in-state tuition was about $10,000 per year(it had been $8,000 just a year or two before). In 2013-2014, in-state tuition will be $32,000 per year. In a paper published in JAMA in November 2012, Seabury et al. compared median physician earnings from 1996 to 2000 with earnings from 2006 to 2010 and found a decrease from $166,733 to $157,751. This only looked at physicians over thirty-five(since many doctors under this age are still in training) and was NOT adjusted for inflation. If you adjust for inflation, that represents a decrease in real earnings of over 28%. Those facts may sound kind of grim but the reality is that although doctors are taking on more debt they are still basically guaranteed a job when they graduate and starting salaries can still be in the 200-300k range depending on specialty and location. If you told me I could get paid 300k but have 300k in student loans I’d take that in a heartbeat since I know that debt could be paid off within just a few years if you live like a resident. It’s tough to sacrifice so much for so long but that’s exactly what doctors are asked to do. They have to give up some of the prime years of their lives in order to pursue education and training so it only seems right that they should be able to splurge once they become an attending and start making the big bucks. But as the White Coat Investor discusses over and over, this is one of the worst financial mistakes you can make. It’s just not practical to take on a mortgage, a car loan and start spending beyond your means in your first year out of residency. As a newly minted doctor, you have to resist the temptation of instant gratification. Instead, think about paying off your student loan debt and investing for retirement because doctors are way behind the retirement savings curve. Just look at the example from my latest Ultimate 401(k) Guide, even if a 32 year old first year attending maxes out their 401(k) for the rest of their career they’ll never catch up to someone like me who’s maxed out his 401(k) for the past 8 years. Oh yeah, and I also get to stop contributing the same year the doctor starts. Let that sink in for a while and you’ll realize how badly doctors need to play catch-up when it comes to retirement. Doctors are used to over-achieving their entire lives, they were the best students all throughout high school, college and maybe even medical school. And that’s probably why they are some of the easiest victims for financial advisors. Smart investors know that passive investing will on average always provide for higher returns than active investing due to lower fees and costs. (It’s also simple math since the return of passive investing = the average market return and active investing + passive investing = the average market return, therefore active investing must equal the average market return. Once you take into account the 1-2% expense ratios to pay active fund managers, you come out way behind). But alas, passive investing will only ever return the average of the market and established professionals like doctors and lawyers aren’t good at just being average. That’s where active managers and financial advisors come in: they are great salesmen. They know exactly what to say to get you to invest your money with them and before long you’ll be underperforming the market and padding their pockets. The WCI does a great job explaining why doctors should stay away from these financial advisors salesmen. There’s definitely nothing wrong with getting help when it comes to your investments but unfortunately most financial advisors are more akin to salesmen than you know, actual advisors. You have to know how your advisor is compensated(the WCI and myself both recommend fee only planners) in order to eliminate conflicts of interest. If your FA works for Wells Fargo and he gets a 1% commission on all the Wells Fargo funds he sells you do you think he’ll be more likely to sell you a Wells Fargo 500 Index Fund(with an ER of 2%) or a Vanguard 500 Fund(with an ER of .2%). That 1.8% difference can literally cost you hundreds of thousands of dollars over 30 years. It’s kind of a Catch 22 since if you’re knowledgeable enough to know what a good financial advisor looks like you’re probably capable of do it yourself investing. But if you don’t have the basics yet, you’re probably stuck with one of these salesmen and don’t even know it. My advice is to read this book or one like it so that you’ll at least have a basis if you decide to go the FA route. I love reading about personal finance since no matter how much you think you know you can always learn something new by reading other people’s material. One of the topics the WCI touched on that I found very fascinating was the chapter about protecting your assets. Unfortunately, we live in a sue happy society and doctors especially have huge targets on their back. Imagine a scenario where someone trips on your stairs and hits their head and decides to sue you. In a normal world, everyone would call this person an idiot and move on with their lives. But in America, this is grounds for a lawsuit and you can be held liable for other people’s stupidity. Whether you think it’s fair or not(and it clearly isn’t fair but that’s life) you have to know how to protect yourself from things like this. The WCI does a good job explaining different types of insurance and also goes into detail about life insurance and disability insurance. New attendings are at their most vulnerable at the beginning of their career and that’s when they want to carry the most coverage yet most probably don’t carry enough. All in all, I thought the book was great. For me, it was a little short but I like to read. It’s probably the perfect length for a busy med student or resident since it can be read in just a few days or 1-2 weeks. My only criticism is that it doesn’t go too in depth into the investing side of things: what to invest in, how to pick your asset allocation, etc. To Jim’s credit though, he does state this fact and gives countless resources to further your investing education. I think he also left the door open for a second book so I’ll be eagerly awaiting that one. Readers, what do you think about my review for the White Coat Investor? Does it sound like something you would like to read? If so, you’re in luck because I’m giving away two copies of the book(one paperback version and one Kindle version). In order to win, please leave a comment and I’ll pick the winners randomly. Please also indicate whether you would like the Paperback version, the Kindle version or either one. I’ll pick the winners after a couple weeks and notify them via e-mail. I find it so amazing that medical school tuition has increased so dramatically over just the last 15 years. Unbelievable! It makes you wonder if it keeps rising at that rate and if doctor’s salaries keep staying flat or going down slightly if there may be a shortage of doctors one day in the future. Will there come a point when people won’t be that motivated to become doctors anymore? It certainly takes a TON of work to complete the training! Kudos to your fiancee for getting in!! Oh, and I’d like to win a copy cuz I’d like to read the book. Thanks for the giveaway! Yea it’s pretty crazy. I do think there will be a transition to using cheaper labor(ie PA’s or nurses instead of doctors) for more routine things and possibly even outsourcing in the future. This has/is happening in nearly every other industry so it’s only a matter of time. Salaries are always the number one expense for businesses and that’s why they’re always looking to reduce them. You can still live a pretty good life as a doctor today even with all the debt but more than ever you have to be careful with the financial decisions you make. In 10-15 years I’m not sure if that will be the case though. Thanks for pointing us towards some valuable information and additional resources, Harry. I’ve never had loans before, so I’m trying to learn as much as I can about how people pay them off quickly. Will definitely check out White Coat Investor. No problem Gabi. If you’re already thinking about how to pay back your student loans you are ahead of most people. I previously stumbled across the White Coat Investor blog before and agree – there is plenty of universal info. Sounds good Mike. I read it from time to time but now that my fiancee is in MS, the articles are definitely more applicable. So much of what you say about medical school applications, the life of a medical student and the debt burden is accurate, although I like to unwind with a beer and few episodes of Archer. Like your fiancé, I’m a newly minted M1. Financial aid is a big issue for many of my classmates. While we’re all guaranteed enough aid in the form of loans to cover tuition and expenses the amount of debt we’re taking on is staggering. Some of my fellow M1s are already over 70K in debt in addition to their undergraduate loans. Additionally, as you (and apparently WCI) point out personal finance isn’t even on the radar for most medical students and financial literacy is low. While we’ve been told to “live like a medical student, not a doctor” multiple times, saving can only do so much and financial advice geared towards medical students is desired but hard to find. I’d like to read this book in all of my free time – paperback please if I win. Yea I think a lot of people subconsciously push to the back of their mind the fact that their loans eventually need to be paid off. It’s easy to say you owe 200k(not for me but for some) but when you actually have to start paying that money back it’s a whole different story. Doctors are still in a good position to succeed but it’s clearly not as easy as it once was. My nephew just graduated from the USAF academy. Now he is off to Walter reed medical school, for free medical training. All while getting paid ~$60K per year as a 2nd LT. I am not 100% sure how much that is worth, but it a bunch. Free undergrad, free med school, and on salary the whole time. Yea it’s a short one but definitely a good read. Also gives you a different perspective which is nice. I recently read an article in The Daily Beast about why being a doctor is the most miserable profession and I think you’ve aptly highlighted similar reasons here. Higher debt, lower pay makes for a very difficult life but I think that with smart investing, this won’t always be the case. Thanks for sharing about this book!! I wouldn’t say it’s the most miserable profession out there but it’s getting closer to other high paying professions(engineering, computer science, etc). Doctors used to be able to get by not worrying about their finances as much as the rest of us but things are changing. But the thing a lot of people don’t realize is that ALL of these higher paying jobs can set you up for early retirement, financial independence etc. The principals in the WCI really pertain to any job or profession. Take someone like me(just a lowly engineer) who will have maxed out retirement accounts(401k, roth and hsa) for 8 years before my doctor friends start making ‘doctor salaries’. I could stop contributing to my retirement accounts completely and they will NEVER be able to catch up to me using tax advantaged accounts. That is a crazy statistic(and one that I reference in my Ultimate 401(k) Guide) if you think about it. Thanks for sharing Harry, I thought this was a great review. I appreciate that it was quick and at the same time a fairly thorough read of the basics, enough to provide some good insight for my busy medicine schedule. Although its an investing book, Jim does a great job of touching on points about other key areas in medicine, especially assett protection. He also does a great job of simplifying the concepts of wills and trusts, and about other types of lesser known retirement accounts which I found usefull. For me personally, WCI made me more financially conscious and brought me back into the investing game and I thank Jim for that. And of course, thanks for sharing Harry, looking forward to your next post and ongoing advice! No problem Joey, yea I think for me it was a little short but that’s because I have so much time on my hands. Now that I think about it, it’s probably the perfect length for a busy med student or resident. Like you, I found the ‘other areas’ pretty valuable too and it actually motivated me to look into some things like umbrella insurance, disability, etc. Glad you enjoyed it. Glad non-medical people can understand the stress and difficulties we face as we pursue our dreams of becoming doctors and helping people. And realize that it’s not as “lucrative” as so many think. If you haven’t yet done the drawing for a free copy, PLEASE add me to the bowl. I could really use one. And as you know…I can’t afford much considering my debt and terrible pay that I will be receiving over the next 5 years. Well unfortunately I don’t think most people realize that quite yet. I think once you become an attending you will find that a lot of people expect you to drive a nice car, live in a nice home and buy nice things because you’re a doctor. WCI touches on it and even mentions a few quotes from The Millionaire Next Door but that is one of the reasons why doctors are huge under achievers when it comes to saving/investing compared to their salary level. And don’t worry, I haven’t done the drawing yet so you’re now entered. Congrats to our winners: Kacey and Alexis. You will both be receiving an autographed copy of the WCI in the mail!